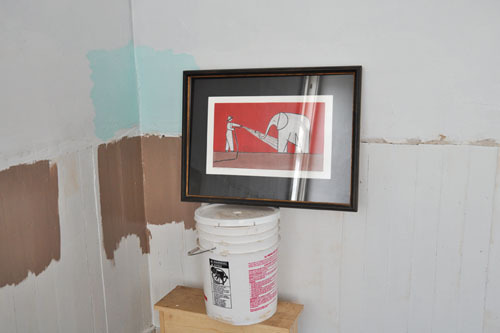 I spent a few hours caulking the many and interesting cracks in the walls that I missed the first time around (and choosing to skip some others for time), then slapped some test swatches of paint on the walls. The wainscoat colour is more like melted coffee ice cream in real life: a little lighter. Something about the all-white walls and the sun right outside the window was blowing out the CCD on my camera. Most important, here it is with one of the pieces of art we have in the bedroom: a screen print we bought on our honeymoon in Seattle. It's not a perfect match for the ground in the print: that's much redder. But it goes nicely and works, I think, better than a gray would under the same circumstances. Now off to buy paint and rollers. I should join the Roller of the Month Club at the rate we've been going through those suckers. And there's still a second layer of primer for some parts of the wall. If the tanins haven't leaked through the test swatch when I get home, I will consider them blocked enough. How long does it take stuff to bleed through paint? I thought it could come through weeks or so later? Few things are better than coffee ice cream:-) That's the color I tried for with my house exterior, although it is not quite right. It looks like that in some light and a bit different in other light. I used a very pale yellow for the trim. The bleed-through could keep happening, but the worst of it happens right after painting -- when the paint is still wet enough to carry the pigment. But the thing I realized when I looked at it later was that even if it does bleed through, it's so close to the tanin colour that you can't see it. It would be more of a problem with a lighter colour or something not-brown. Oh hey! We've got a couple Linnea Lundmark prints from Seattle, too! But we don't have as pretty a wall to put them on. That room looks great!